PERIOD OF RECORD.--Stage-only records from May 1933 to current year. Prior to October 1937, published as "Okoboji Lake at Arnold's Park". October 1937 to September 1966, published as "Okoboji Lake at Lakeside Laboratory near Milford". GAGE.--Water-stage recorder. 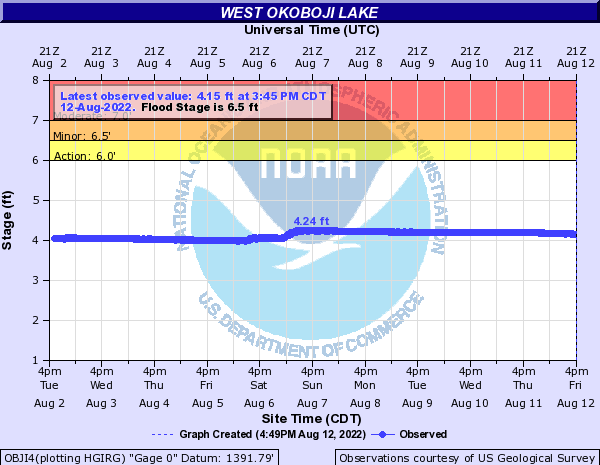 Datum of gage is 1,391.76 ft above National Geodetic Vertical Datum of 1929 and 94.51 ft above Iowa Lake Survey datum. Prior to June 17, 1938, non-recording gage at State Pier at Arnolds Park at same datum. REMARKS.--Lake formed by concrete dam with ungated spillway at elevation 1,395.8 ft above National Geodetic Vertical Datum of 1929. Lake is used for conservation and recreation. Area of lake is approximately 3,900 acres. WATER TEMPERATURE: October 2011 to current year.